As much of a Mac fangrrl as I am, I've never been a Safari fan. I dunno why, it just never *felt* right. So it was Netscape...and then Firefox & Chrome. Of course the iPad only came with Safari so when I heard that Google Diigo came out with a FREE new browser app called iChromy which offers an identical browsing experience on your iPad with a smooth user interface, free apps, and some rather nice features - I was excited! 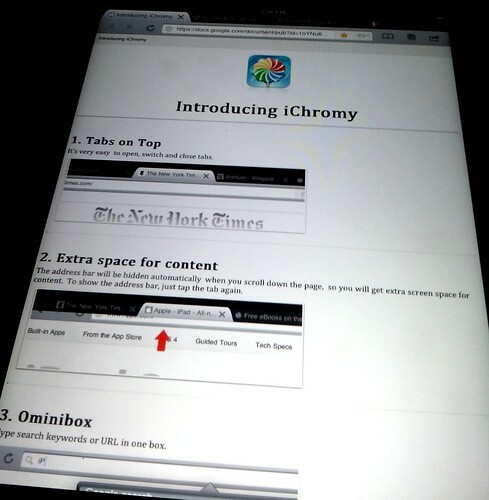 When researching this I came across a great article on Cult of Mac:(link below) "iChromy’s attempt to mimic Google Chrome on the iPad makes it one of the nicest third-party browsers for the iPad I’ve used. One of its best features is its tabbed browsing: just like Chrome all of your tabs sit at the very top of the browser and it’s simple to switch between them and open & close individual tabs." SWEET! (Correction: In my excited reporting of this new APP I jumped to the conclusion that Google came out with this but it was the AWEsome people at Diigo who actually did! Thx to Eric in comments for the correction & I'm happy to make it!) That means a seamless feel from laptop to iPad! Now, this is not BETA but does have a bit of a Beta feel... What looks different from Firefox? Once you install it you'll notice that iChromy’s address bar "combines both URL entry and search into one box in an effort to keep its UI clean, and when you begin to scroll down a page, this bar is hidden to provide you with more room for content." I don't know how long it's gonna take me to stop looking for my Google search bar on my top right but I'm more than willing to give it a whirl! "There’s a built-in reading list with ‘read later’ functionality with which you can save web pages to view later offline. There’s also support to save and share content with your friends on Facebook, Twitter, Tumblr, Diigo and Instapaper." Hmmm So...that makes me run & download it...I'll report back later on my user experience. UPDATE! 6/29 I got an email from co-founder of Diigo with this exciting news! FYI - we have just released a new update V1.1 in App Store, with more enhancements & fixes in response to many user suggestions. So in addition to tabs, offline browsing and fast speed, the new version now allows Incognito Mode, Find in Page, Photo Save, Quick Dial, and lots more. For the complete list of new update, please see http://bit.ly/ichromydiigo for more detail. Also, I want to give you a heads up: our next version release will be a major one that includes integration of highlighter and annotation features, unique core services by Diigo. Stay tuned! 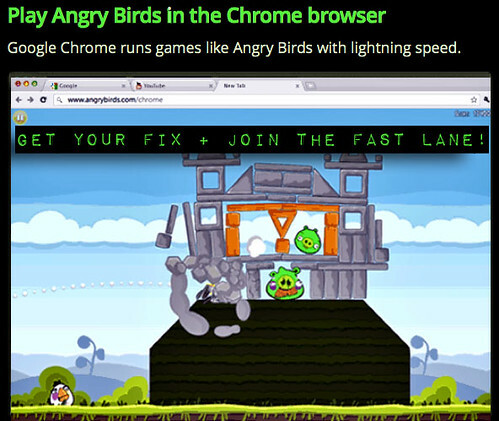 In the meantime I got intrigued by the Mac v. of Chrome for my MacBook...and then..I'll admit, whilst shopping online, I saw an ad for my beloved Angry Birds game built inside the Chrome browser! WHAT the WHAT!?? and then Oh Happy Happy! How much of a Google fan am I? 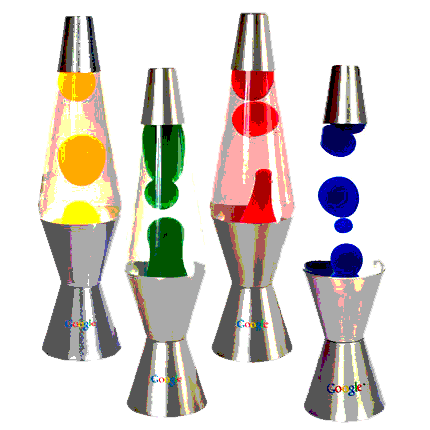 I've mentioned before my 2004 Google App webpage (now visually embarrassing -but still geek street cred cool - designed for 640X480 screen! 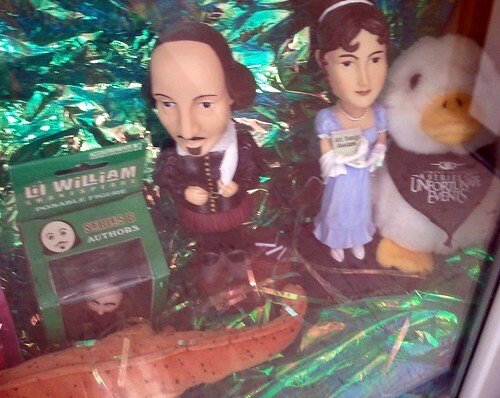 LOL) "Doing Backflips Over Google for Yahooligans" And now.... to show off my office decorations feat Google swag (or toys!) I give you this! I always wonder what other peoples offices look like - well, this is mine which I share with my AWEsome assistant of near 20 years Mrs. Robin Black. (obviously.a.saint) See? 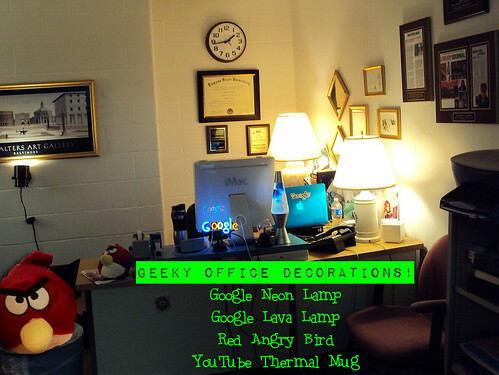 My Google Neon Lamp, Google Lava (Motion) Lamp ($15.85 while supplies last) my fav Red Angry Bird, YouTube thermal mug ($12.05) which sadly doesn't fit under my Kerurig and other toys like my Torchwood Capt. 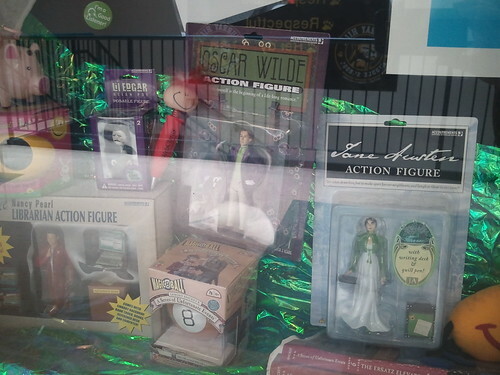 Jack Harkness action figure. Now Google, don't think I'm sucking up to you! (however tempting that is!) Back in the day I used to be able to email a marketing guy at CDIGateway & share that I was doing a Google centric preso & they would overnight me swag! Ahh those were the days! Obviously, no longer! 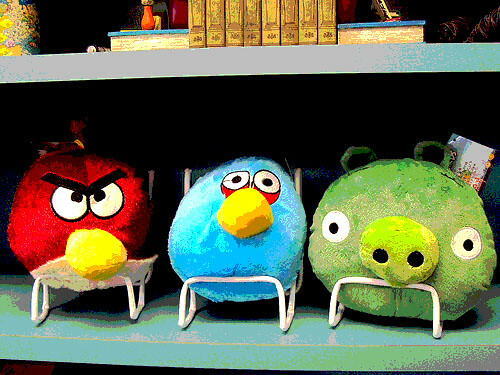 Free Angry Birds game | google.com Play Angry Birds with the new Chrome Web App - Exclusive levels! 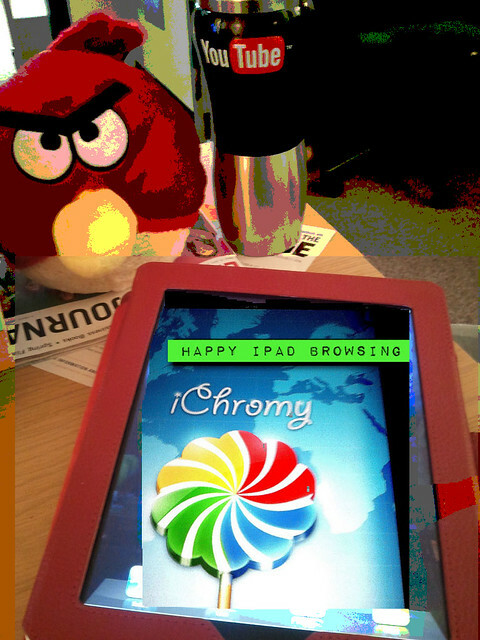 Thanks so much for turning me onto iChromy. I had missed the announcement, but as soon as I saw your post, I popped it onto my ipad. Best part? The very next day, my principal came down to my office carrying his ipad and said "can't you fix this so I can have tabs in my browser?" and I hooked him up. He was happy, and I get to look like a rock star - for at least part of the day! 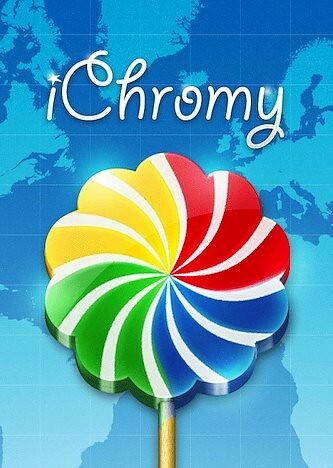 iChromy is not made by Google, it's by Diigo (they do a web bookmarking service). As far as I can tell, the only relation to Chrome is the ideas it borrows, though of course Chromium is open source so they could have borrowed some source code as well. Opera Mini is also a pretty nice, tabbed browser available for all iOS devices, not just iPad. Eric! Thank you so much for the correction and I belatedly put it into the blog posting... I've been a little busy lately with the end of school & ISTE11...But you are AWEsome! I swear I have the best Readers & PLN in the WORLD! Thanks again hon & see the amazing update from the co-founder herself! I know, right? Crazy cool! Gwyneth - found your blog while surfing in a zillion different places, so not even really sure how I got here, but just wanted to tell you how awesome you are. 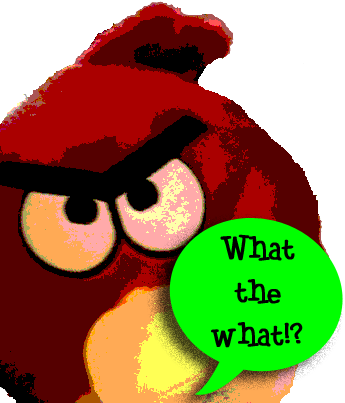 I LOVE the Comic Life tutorials- am a huge comic life user myself...and a fellow librarian. Congrats on the GTA acceptance and thanks for everything you do. I feel like I've found a treasure trove. Wow Janice! Thank you! I'm terribly flattered & pleased that you've found my blog helpful! I love comments like this...heck, I don't even mind the critical comments but AWEsome ones like these are the BEST! Cheers!